It's a great time of year for fishing and viewing the fall colors. The fishing has stayed hot and I'm sure it will continue as another big fish stocking is scheduled for Tuesday, September 30th. As for the colors they are starting to turn and should be in full effect within a few weeks. Catch of the Week: Congratulations to Dwayne Bell from Lancaster, CA with an excellent fish pulled from Convict Lake at Hangman's Tree. He was using a nightcrawler when he scored this stout 5 pound 1 ounce rainbow. Great job Dwayne! Tactics/Bait: The lures of choice this week were Thomas Bouyants, Roostertails and Needlefish. Gold/red and silver were the hot colors on the lures. Mice Tails and Power Worms were also knocking them dead all week. For trolling use a rainbow Rapala, Needlefish,Tasmanian Devils or Marvel Fly Lures. The most successful Powerbait color was Rainbow. Any Powerbait with garlic continued to be deathly. Using a garlic dip can also increase the number and size on the fish you catch. All along the North Shore and Inlet were the hottest spots this week. Other locations fishing well were the South Shore and Hangman Tree location. DFG is scheduled to stock the creek early next week. At the creek give salmon eggs a shot. Weather: The forecast for the beginning of next week will start with chance of showers and by Monday it is forecasted to be mostly sunny. Temps will be dropping but by Tuesday they will start to warm up again. Highs are going to be in the low-50's and the lows in the high-30's. By Tuesday the highs will be back up in the low-60 The weather is away changing day to day in the high country. Make sure to visit the National Weather Service link which is usually accurate: 7-Day Forecast Convict Lake. Sunrise - Sunset: Sunrise this week 6:48am - 6:53am and Sunset 6:47pm - 6:38pm. 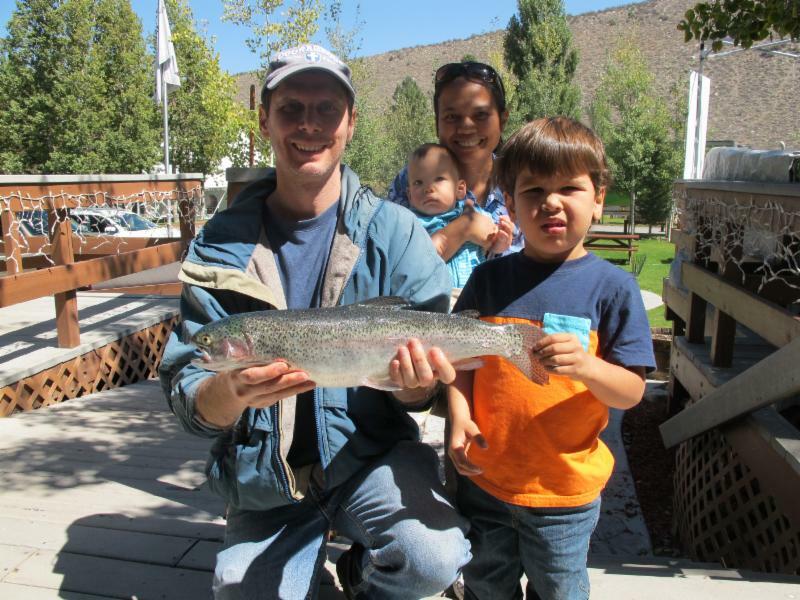 Stocking: The Convict Lake Resort will stock the lake with 400 pounds of trophy trout on September 30th. DGF is scheduled to plant at the lake the week of September 28th.